As we celebrate the International Day of the World's Indigenous People this year,9 August, many of the estimated 370 million indigenous peoples around the world have lost, or are under imminent threat of losing, their ancestral lands, territories and natural resources because of unfair and unjust exploitation for the sake of 'development.' On this day, let us ask the crucial question: who actually benefits from this so-called development, and at what cost is such development taking place? When indigenous communities are alienated from their lands because of development and natural resource extraction projects, they are often left to scrape an existence on the margins of society. This is certainly not a sign of development. Many such projects result in human rights violations involving forced evictions, displacement and even loss of life when social unrest and conflict over natural resources erupt. This is certainly not what we mean by development. Natural resource extraction projects such as mining are land-intensive and water-intensive and often directly affect the collective rights of indigenous peoples to their lands and territories. All too often we see conflict between corporations, indigenous peoples and the State over development projects which are initiated without consultation or consent of the very people who are dispossessed of their land. In Malaysia, for example, planned hydroelectric dam projects in Sarawak and Sabah have caused great concern for indigenous peoples, who are either being displaced or dispossessed of their lands. The Penan people have received threats and there are reports of harassment of the Penan by workers of logging companies. Various complaints and claims have prompted SUHAKAM, Malaysia's human rights commission, to initiate a national inquiry on the land rights of indigenous peoples. In India, social unrest and conflicts over land acquisition for development and mining projects have increased in recent years. 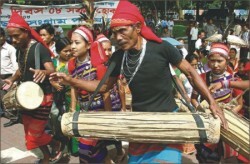 Adivasis defending their ancestral lands and community forests are often subject to threats and harassment, despite the existence of constitutional protections, Supreme Court judgments and progressive national legislation requiring consent of tribal communities, and community rights over forest use. In a positive development in 2010 the Ministry of Environment and Forests in India stopped the Orissa government and Vedanta, a multinational mining company headquartered in the United Kingdom, from mining in the Niyamgiri hilltop in Kalahandi district, since such an operation would severely affect the ecology of the area and the situation of the Dongria Kondh Adivasi people living in the mountains. Threats against anti-logging activists working to protect the Amazon forest in Brazil have been long ongoing. Recently, José Claudio Ribeiro da Silva and his wife Maria de Espirto, both anti-logging activists and defenders of indigenous peoples' rights were killed in the Brazilian state of Para. My Office continues to directly monitor the impact of extractive industries and development projects in a number of other countries, including Bolivia, Cambodia, Guatemala and Mexico. In many cases, extractive activities in indigenous territories are pursued by multinational companies headquartered in developed countries. Moreover, extractive industries are often present in the areas inhabited by indigenous peoples in these nations. For example, intensive oil and gas development continues in northern Alberta, Canada in the areas where the long-standing land claims by the Lubicon Lake Nation remain unresolved. In the Nordic countries, the Sami are concerned about the impact of mining, forestry and other natural resource extraction on reindeer husbandry. Many States maintain contradictory or antiquated laws on mining and land acquisition for development. These laws must be re-assessed to determine if they are consistent with international human rights standards and principles. Such reviews must be conducted in consultation with indigenous peoples and in good faith. Indeed, proper consultations must be conducted with indigenous peoples at all stages of the development and natural resource extraction cycle. They are entitled to full disclosure of environmental, social and human right impact assessments in a language of their choice. States should also provide financial and technical support to enable indigenous peoples to consult with corporations. When indigenous peoples consent to such projects, they should have a right to a fair share of benefits from activities on their lands. And where projects proceed without consent, mechanisms for redress are required. International and national institutions financing such projects must ensure their operational policies and guidelines are consistent with international human rights standards and principles. On their part, extractive companies have a responsibility to respect human rights. This was affirmed in June 2011 by the UN Human Rights Council when adopting the Guiding Principles on Business and Human Rights. The UN Declaration on the Rights of Indigenous Peoples makes explicit reference to free, prior and informed consent. It is very clear about this requirement for the “development, utilization or exploitation of mineral, water or other resources”. This is further reinforced by international treaties such as ILO Convention No. 169 and in the jurisprudence of human rights treaty bodies, in particular the Committee on Economic, Social and Cultural Rights, and the Committee on the Elimination of Racial Discrimination. The right to development is a human right for all, and indigenous peoples have the right to define and determine their own development. On this International Day of the World's Indigenous People, let us ensure that development for some is not to the detriment of the human rights of others. Let us work together to ensure true development for all. Each year, International Youth Day (IYD) is assigned a theme; a conceptual slogan that communicates the scope, direction, and objectives of the year's youth initiatives and also provides a unifying banner from under which individuals can draw the inspiration to take action. This year's International Youth Day (August 12) represented the culmination of the International Year of Youth (IYY) - designated by the United Nations to comprise the 12 month period between IYD 2010 and IYD 2011 - and the 25th Anniversary of the first International Year of Youth. 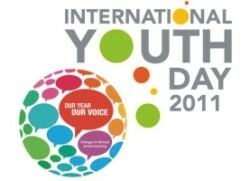 As such, “Change Our World” has been chosen as the theme for IYD 2011 as it not only expresses the level of impact that young people strive to achieve, but also reflects the notion of a global community that is a core principle of the United Nations. “Change Our World” is meant to be a call to inspire youth initiatives at all levels with the idea that efforts at the local level can have a global impact. Youth are well attuned to modern forms of communication that have the capacity to connect people from all over the world with ease, and at an unprecedented speed. UNPY encourages the use of social media & networking tools as platforms for raising awareness and promoting activities, empowering youth, and enabling them to quite literally change our world. Dialogue and Mutual Understanding". The choice of theme reflects the UN General Assembly's appreciation of the value of dialogue among youth from different cultures as well as among different generations. It should be stressed that “Change Our World” is a call for continual, long lasting progress in areas of societal development that concern youth. Therefore, while the support of the private sector, governments, and civil society organisations is important, what's most necessary is that young people be actively involved and that they claim ownership of this positive effort.